Let's talk about what to buy in Myanmar during your trip to this Buddhist country of Southeast Asia. As in all of Asia, craftsmanship occupies a prominent place when it comes to finding souvenirs from Myanmar, and each region has its typical products. There are many typical products which you can buy in Myanmar, starting with puppets, umbrellas, paintings, amber, bronze and wood products, fabrics, lacquers, and silver jewelry, as well as jade. On the other hand, religious images, fossils, opium pipes, old coins, or historical documents, are forbidden to be removed from the country, except with express authorization. Bearing this in mind, let's see what to buy in Myanmar and what the most typical souvenirs of the country. The country is one of the most important producers of sapphires and rubies worldwide, hence it is the perfect place to find them at a good price and high quality. Of course, be careful to shop only in licensed stores, where they give you the corresponding certificate of authenticity. In addition to sapphires and rubies, jade is another of the precious stones to buy in Myanmar. Its use in jewelry is widespread and, together with China, it leads the world market. Jade, besides being very appreciated in jewelry, also has a special cultural significance. Burmese artisans are experts in lacquering, creating true works of art with hundreds of shapes: boxes, ashtrays, trays, bags, sculptures and endless products. To make these pieces of handicrafts, they use bamboo which, through a drying process and several layers of lacquer, is finished with polishing and sculpting, resulting in fine objects of great quality. What better souvenir to buy in Myanmar than a box lacquered in red, blue or green, or perhaps in an aged yellow or black tone; the possibilities and the objects to choose from are endless, so you will surely find what you are looking for. Another of the typical products of Myanmar are fabrics; linen, cotton, and silk are the main products which are used to elaborate dresses, handkerchiefs, and high-quality accessories. The manufacturing process is totally handmade, from its collection to its spinning and manufacturing. The price you will pay for the Burmese fabrics is laughable if you compare it with its great quality. 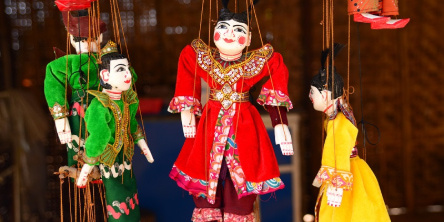 One of the souvenirs of Myanmar which most tourists buy is puppets. They are really pretty and represent both animals as well as humans, and they are made entirely by hand. To make them use brightly colored wood and fabrics, and if you want to get a good price, don’t forget to haggle. Who has not traveled to an Asian country and brought back a small Buddha statue in bronze, stone or wood? Well, one of the typical products to buy in Myanmar is without a doubt the bronze sculptures. Buddha figures in all their forms: sitting, standing, lying down, and with the different mudras and meditation positions, are by the thousands in the markets. Although supposedly the laws prohibit their sale, you can get one of these beautiful figures if you manage to bargain at a good price. Although the silver used in Myanmar is not among the highest quality in the world, it is true that its designs are very beautiful and exclusive. The artisans of silver make delicate and unique, very sober but original pieces which you will surely want to take as a gift. In Inle Lake, there are the best goldsmiths in the country, and this is where you can find the most beautiful works at the best price. Of all the typical products of Myanmar which tourists take home, tapestries occupy one of the top positions. They are made with different pieces of cloth, which are joined together by sewing them with gold and silver thread. The result is a beautiful set of delicate colors that represent mostly mythological or religious scenes. As for the paintings, you can buy both acrylics and watercolors from local Burmese painters. If you want a special gift, you can buy some of the watercolors made by Buddhist monks, whose price is symbolic, and whose beauty will captivate you. As a good Asian country, in Myanmar, the traditional elaboration of umbrellas has become a tourist attraction. You have them of all sizes and colors, and they are one of the most requested objects to buy in Myanmar. You can find them almost everywhere, although if you want to visit a real workshop of umbrellas, in the Inle Lake, you will be able to see how women make these precious objects by hand, with great patience. This way you will appreciate the work which it takes to make them, and you will be able to take some of better quality. Besides all the above, there are many more typical products in Myanmar which you can take as a gift: necklaces, earrings and seed bracelets, wooden sandals, tobacco, not to mention coconut oil and delicious Burmese sweets. With all this information, you know what to buy in Myanmar, but, above all, don’t forget to visit the artisans and value the work behind each object. If Myanmar has caught your attention, leave us your number so we can call you to discuss the voyage that awaits you.